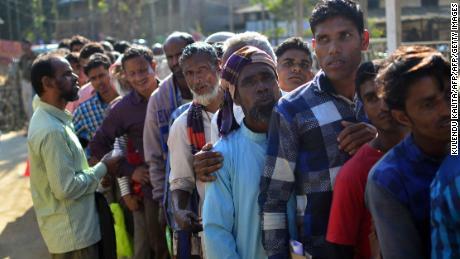 The publication of the National Register of Citizens (NRC) on Monday comes amid popular anger over illegal migration into Assam, which shares a porous border with Bangladesh.Proponents of the registry say it will help root out illegal Bangladeshi immigrants, but the move has prompted fears of possible deportation among Assam's hundreds of thousands of Bengali-speaking Muslims. The decision to impose a state-wide register of citizens has drawn parallels with Myanmar's Rakhine State, where Rohingya Muslims have long faced persecution owing to their Bangladeshi ancestry. Last year, hundreds of thousands of Rohingya were forced across the border into Bangladesh as part of a targeted attack labeled by the UN as ethnic cleansing. Tensions over citizenship have been brewing for decades in Assam, resurfacing earlier this year with a government effort to root out "Bengalis" and "foreigners. "Many of the state's Bengali community have lived in India for decades, crossing the border into Assam during the bloody Bangladesh (formerly East Pakistan) independence struggle in 1971. Many others can trace their history back even further, arriving before the independence of India in 1947. Security has been tightened across the tea-rich state in anticipation of potential anti-immigration violence in the wake of the registry's release. Out of the state's 32.9 million population, 28.9 million people have been recognized as legal citizens.Assam is the only state in India to have a citizenship register. It was created in 1951 to identify Indian citizens from illegal migrants from East Pakistan. The cutoff date to be eligible for Indian citizenship is March 24, 1971, a day before the onset of the Bangladesh Liberation War.Authorities said that no one will be deported until an appeals process is cleared. Officials have made reassurances that those left out of the list will be able file appeals from August 30 until September 28, 2018. Anand Sharma, a senior leader of the main opposition Indian National Congress party, said the credibility of the process was questionable. "This has interstate repercussions, involves humanitarian aspects and our relationship with the neighboring state of Bangladesh," he told reporters Monday. "Families should not be separated. The government of Assam should hold a meeting with all political parties of the state. "Writing in the Economic and Political Weekly, Sanjoy Hazarika, a human rights activist and Director of the Commonwealth Human Rights Initiative, said it was unclear what will happen to those who could find themselves stateless. "While a number of illegal immigrants may emerge through the NRC, there is no clarity on what happens after identification and prosecution: they cannot be deported for there is no such arrangement between India and Bangladesh. Will they be left in limbo without rights? Many, both Hindus and Muslims have apparently established homes and businesses, schools, farms and factories. Such persons include school and college students," said Hazarika. "What is the process of handling their cases? Will they be pulled away from their homes and each other? Where will they be detained? These questions need to be answered," added Hazarika, posing questions both the Indian and State governments have yet to address. Speaking at a press conference after the launch of the final draft list, Sailesh, the Registrar General and Census Commissioner of India, attempted to calm fears, suggesting that the State government would begin a period of "claims and objections." "We'll wait for the finalization of the NRC … No punitive or penal action will be taken," added Sailesh.India's Home Minister Rajnath Singh released a statement on Twitter on July 22, saying: "The Citizenship Rules provide that any person who is not satisfied with the outcome of claims and objections can appeal in the Foreigner's Tribunal. Thus, there is no question of anyone being put in a detention center after the publication of NRC. "In 1983, hundreds of people were killed in Assam by mobs intent on driving out Muslim immigrants.The renewed process to update the list began in 2015 under the supervision of the Supreme Court of India. Those whose names or the names of their descendants appeared in the NRC 1951 will be included in the final draft, which is expected to be released in December 2018.